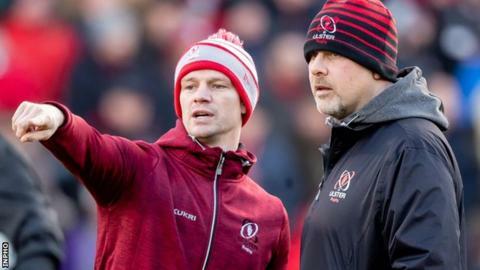 Assistant coach Dwayne Peel has urged the Ulster players not to allow the "opportunity slip" in their Champions Cup quarter-final against Leinster. The two Irish provinces will meet on Saturday in a repeat of the 2012 final that Leinster won to retain the title. Ulster have only won five of their 16 derbies with Leinster since that final. "It's an opportunity for us, that's how we must approach it, to pit ourselves against what has been the best side in Europe for a few years," said Peel. "We look at them like we look at any other team and think 'right, maybe there's an area here where we can look at or maybe an area there' and for us it's about the excitement of going down there with a chance to go after them. "In Dublin as well, with a 15,000 (away) crowd so it's a great opportunity for our guys and excitement levels are through the roof." Under head coach Dan McFarland, Ulster are enjoying a successful season and are competing in the European knock-out stages for the first time since 2014 following an impressive pool campaign that saw them progress as one of the best-placed runners-up. "Throughout the season, we've tried to give the players the freedom to play," Peel said. "I just want them to go and express themselves, that's the biggest thing. We spoke about not letting the opportunity slip and about going after them and if we're good on the day then I'm sure we can trouble them." Leinster are defending European and Pro14 champions and boast a squad laden with British and Irish Lions and Ireland internationals, including 2018 World Rugby player of the year Johnny Sexton. The Dublin-based province scored the most points (204) and the most tries (27) during this season's Champions Cup pool stages and only had their seven-game winning run broken by Edinburgh last weekend as head coach Leo Cullen chose to rest some first-choice players. Peel admitted there is some nervousness about taking on the European champions in their own city, adding: "In every game there's always going to be a tiny element of that [fear factor] but I hope that we have excitement as well. That's the big thing for us, to help create that confidence, not fear. "In any game, people are going to be nervous, the most experienced player on the pitch will still be nervous going into Saturday, no question about it, but it's about how you react to that and how you build excitement as well and how you get confidence in the guys to go and perform." In the only meeting between the two provinces this season, Leinster scored six tries in a 40-7 rout of an experimental Ulster side in Dublin but both starting teams are likely to be significantly different on Saturday. Leinster are expected to recall the likes of Sexton, Tadhg Furlong, Cian Healy and James Ryan but Ulster will be bolstered by the return of Ireland captain Rory Best as well as Jacob Stockdale and Jordi Murphy although lock Iain Henderson is considered "touch and go" with a knee injury.